Join us at 5:30 p.m., Monday, Oct. 31 in Gilman Hall 50 (Marjorie Fisher Auditorium) for the 2016 Samuel Iwry Lecture. The lecture, titled, "Ancient Israelite Scribal Education: New Insights from Kuntillet Ajrud," will be given by William M. Schniedewind, Kershaw Professor of Ancient Eastern Mediterranean Studies, University of California, Los Angeles. Please join Professor Schniedewind for coffee before the lecture at 5 p.m. Faculty, Student, and Alumni Awards – Congratulations to All! 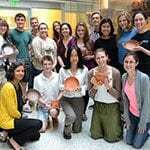 Re-creating Ancient Greek Ceramics, the spring 2015 undergraduate class designed by Sanchita Balachandran, was recently featured at Archaeology, the magazine of the Archaeological Institute of America. 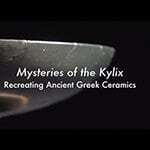 It is also the subject of an 18-minute film titled "Mysteries of the Kylix," which follows the semester-long archaeology experiment. 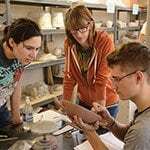 For the past 13 weeks, the students in Sanchita Balachandran's "Recreating Ancient Greek Ceramics" class have undertaken a distinctly different type of apprenticeship. Throughout this hands-on course in experiential archaeology, they have consulted the work of experts and practiced throwing clay pots.